Back in the end of May 2010, we went on an excursion to Cameron Highlands; and thus were duly introduced (albeit rather late) to Strawberry Moment Dessert Cafe in the town of Brinchang. Cool breeze and crisp, fresh air marks a pleasant respite from the hectic/routine lifestyle on the lowlands; punctuated with a delightful array of strawberry desserts and beverages. A spacious, bright and airy ambience with a chic finish; designed by one of the owner herself. Even the menu was designed in-house, further saving up on the operational cost. 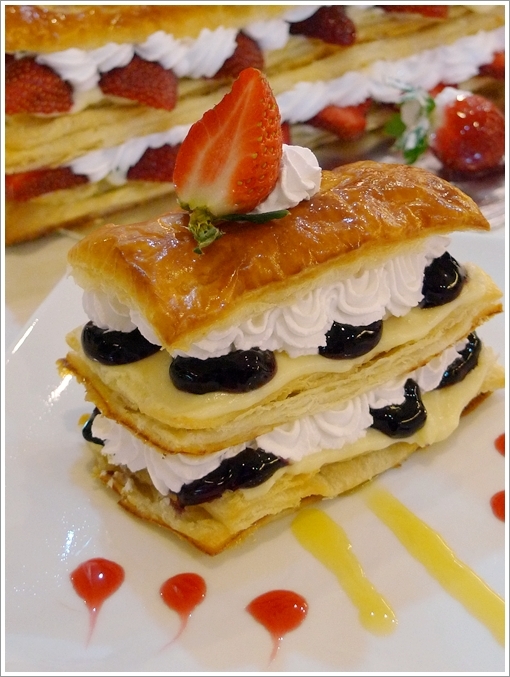 Then they decided to branch out from their two outlets in Cameron Highlands, bringing the taste of their delectable desserts and signature creations (especially their commanding Strudels) down to Ipoh. A smart choice, considering the fact that back then, De Garden was devoid of a proper hangout spot for desserts and drinks, save for Pappa Rich. An astonishing number of desserts (more than 20 types) dominate their menu, with emphasis on desserts made with fresh fruits (majority of them with strawberries; of course), chocolates (from their very own chocolate factory in Cameron Highlands named Avant), and various beverages including Illy coffee, fresh juices, milk shakes, and tea. The Strawberry Parfait (parfait refers to a type of American dessert closely resembling a sundae) presented was a sight for sore eyes. Layers of fresh cream, chopped strawberries and lover’s fruits (buah cinta), with bits of crunchy chocolate in between, made up the tall ensemble served in a tall and transparent glass. This is one dessert highly suggested to be shared, so don’t go all out and order one each. The milk shakes (strawberry, oreo, lover’s fruit, blueberry and vanilla) are all priced at RM10.90 each, a little steep maybe. 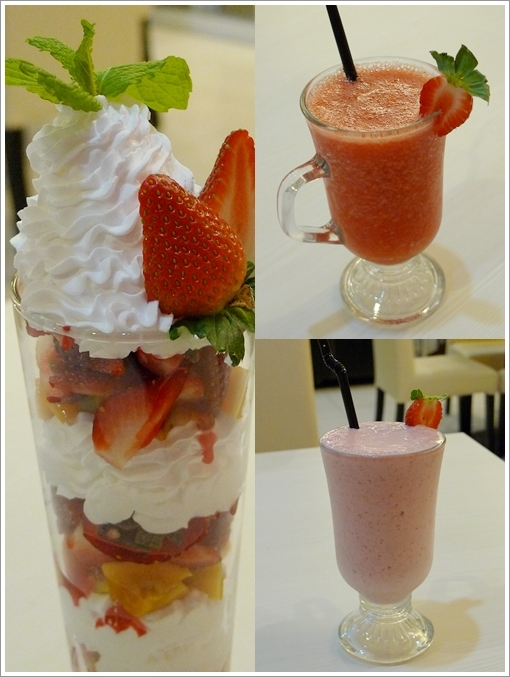 But reasonable enough considering the fact that they really use fresh fruits for the respective shakes. 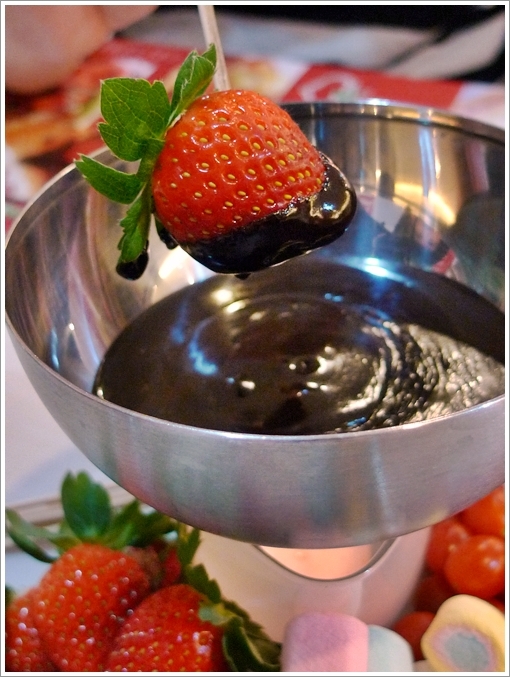 A Strawberry Mini Steamboat (chocolate fondue) @ RM17.90/USD5.80 for 2-3 pax. The chocolate fondue; also known as Strawberry Mini Steamboat in the menu comes in two sizes. The Mini one for 2-3 pax, while the Maxi version for sharing amongst 5-6 diners. Fresh strawberries, marshmallows, and cherry tomatoes were served together with a heated steel container filled with melted dark chocolate. Thankfully, the molten solution was not as diluted like some chocolate fountains in buffet restaurants. Aside from bingeing on the sweets, they do offer a “Heartier Meal” section with limited savouries like spaghetti, fish & chips, sandwiches, and of course; fresh salads. 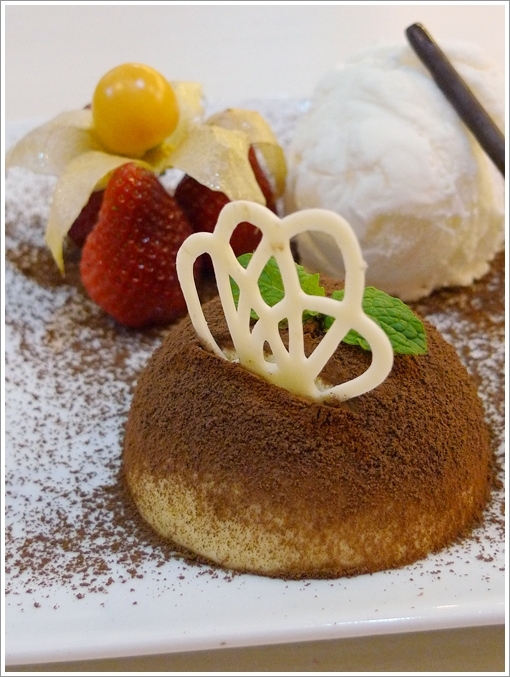 Tiramisu Mousse with Ice Cream (RM12.90/USD4.20) – A custard-like texture infused with a caffeine kick from the sprinkled coffee powder, served with fresh strawberries, an unconventional decor of fresh gooseberry from their farm, and a scoop of vanilla ice-cream. Strawberry Ice Baby (RM11.90/USD3.80) – One of my personal favourite, you might have seen this from the Cameron Highland’s post before. Blended ice-cream, strawberries, ice and lots of sago pearls. 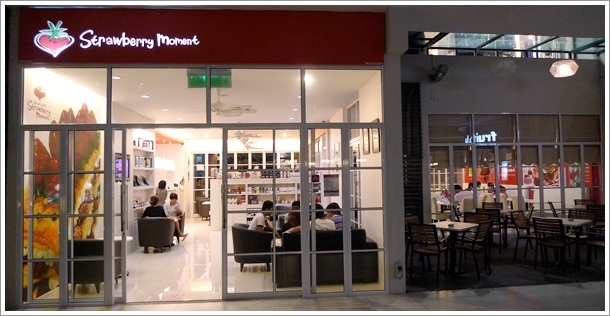 Of course, a visit to Strawberry Moment Dessert Cafe without a taste of their famous Strudel is almost uncalled for. Imagine going to a ‘Nga Choy Kai’ outlet without trying the bean sprouts, and you get the idea. Although they only offer two flavours; Strawberry and Blueberry for the time being, these pastries are hands down their top sellers. Come Christmas, they will be decorating the whole strudels (RM29.90 each) with the right ornaments; usually powdered with icing sugar if I am not mistaken; to create the snowy, Christmas-sy atmosphere. 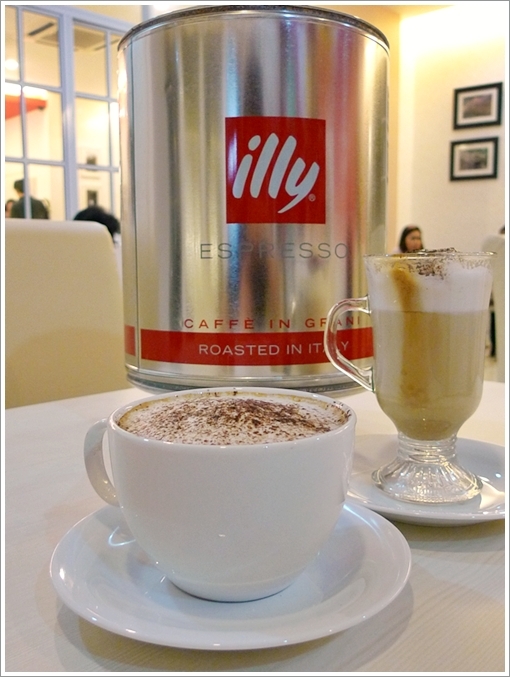 Aside from SSTC, Josephine and Italia Mia, I guess Strawberry Moment‘s the next place to serve Illy Coffee; a pleasantly aromatic flavour derived from the beans from Italy. In case of an ‘overdose’ on strawberries-laden food and drinks, consider going for the Chocolate drinks made from their own brand of chocolates; Avant. Or wanna kick back, seated on the plush sofa in one corner with a magazine at hand, and a cup on the other? 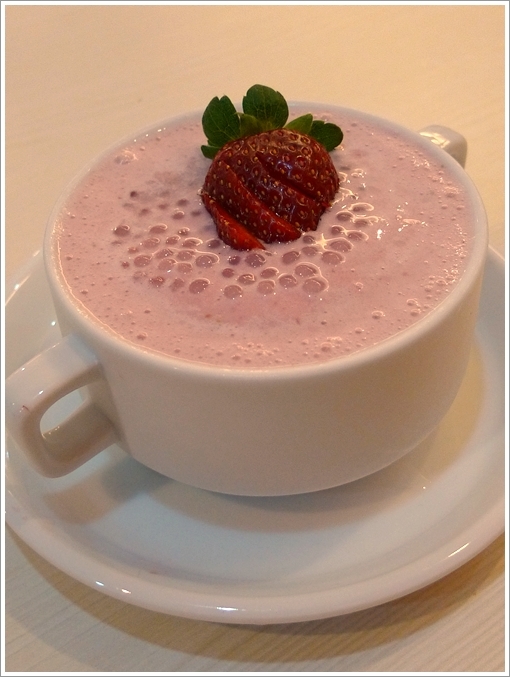 A cup of Strawberry White Coffee (RM5.90) or Strawberry Cappucino (RM6.90). That might settle the initial hesitation. Some of the selected products to be bought from the cafe. If you want the full range, you have to order from them, or hop over to their outlet in Brinchang. Since I was told that the request for souvenirs/gifts from the customers are omnipresent, they have decided to pack various soft toys, wrapped chocolates and paraphernalia into small, cute bundles of gifts for various occasions. Or just something to present to your loved ones. 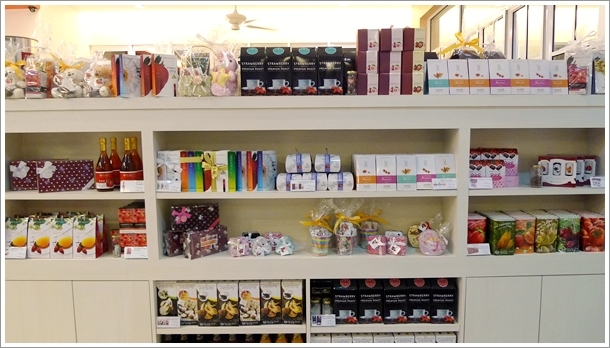 You can also buy strawberry tea, coffee, and dried fruits from the display cabinet. 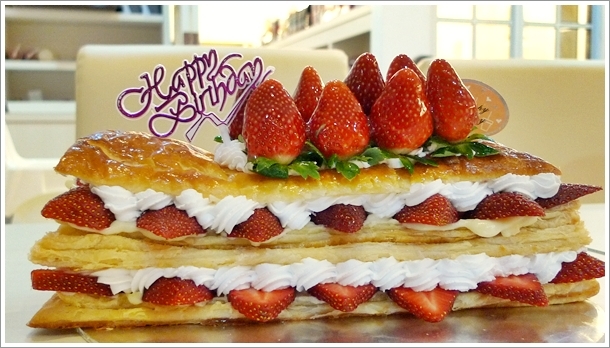 The cakes can be made-to-order, starting from RM60/USD20 per cake of about 1kg. Or just buy a Strudel instead, for a lighter dessert but more or less the same celebratory concept. Yes, you can ask for candles and a plastic knife (cutter?) would be provided too. Choose to be seated inside the cafe, or enjoying your desserts al fresco. Soon, they will be introducing various new items into their menu. Emphasis would be on the savoury dishes, as some customers (me included) felt that the selection can be improved to further expand the patronage from the lunch and dinner crowds. Medan Ipoh, 31400 Ipoh, Perak, Malaysia. *This cafe is situated next to Oh Sushi!, and opposite of Ding Fung Shabu-Shabu. Nah, there were four of us. One person eating all that would take forever! Haha, until mom cannot recognize you?! Strawberry Strudel looks nice but taste rather bland. I can’t deny that I have tasted better strudels elsewhere, but for the reasonable price at Strawberry Moment, I ain’t complaining. Plus, not many places make strawberry strudels, as opposed to apple’s. 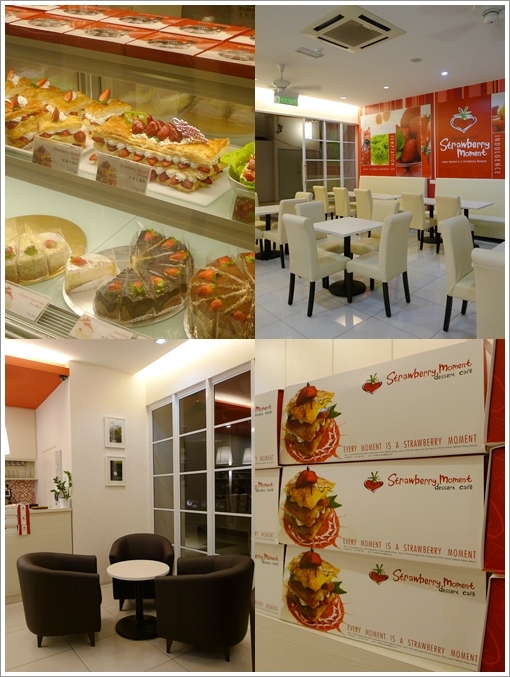 I wrote about Strawberry Moment back in May, that Cameron Highlands outlet. 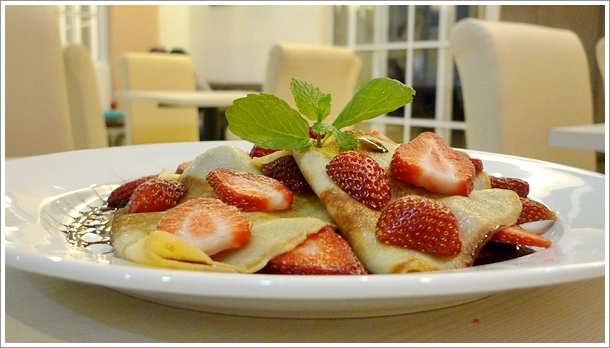 But as of late, I blogged about Singberry, another similarly-themed cafe in Ipoh Garden South. Nope, not this round Babe. But we did try the cappucino and latte. Illy coffee’s good though. 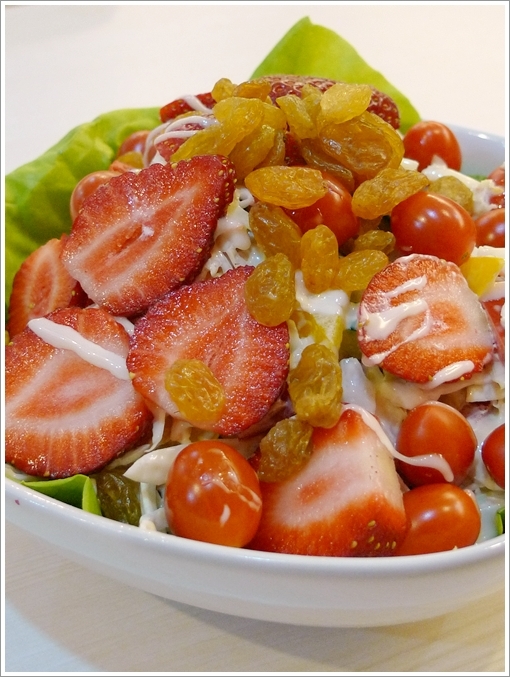 VERY appetizing pictures of strawberries – be it strudel, parfait, anything! But were they sweet or sour? There were FOUR of us. Haha, of course I myself cannot stomach so many desserts at one shot! yup, agree with you, it has very comfortable layouts and ambiance, really a great place to just hang out and chit chat…. nice meh? i feel their strawberries very sour but service and ambiance was good though. that’s why i don’t really like strawberries. it’s so hard to get sweet ones here. that’s why i was skeptical abt your write up on Singberry but since u said it was good will try it when i have the chance. Oh, truthfully …. the Singberry’s strawberries were much juicier and sweeter compared to Strawberry Moment. But then again, Singberry capitalizes on their fresh strawberries, but Strawberry Moment on their cleverly disguised desserts. Offering much more in terms of selection loh …. Depends lah, sometimes some outlets do soak theirs in syrup and such. So you get very sweet but artificially enhanced fruits, while the sour ones resemble the original taste more. the juices and shakes are worth the $ with the fruits that went into them. pasta sauce is very generous with veggies too. and those veggies are fresh but taste wise, is a tad sweet. suspect sugar is used instead of msg. In the Ipoh one or the Cameron one? your blog r very nice,especially the template ,u did the template urself?actually im looking for a best template that suit me,i think i really need ur template !can u share ur template with me !! i promise i will not copy directly ur template,i will make some customization on that !may i ? Thank you,i very appreciate that u give ur template to me !nice talk with u! It’s gone. Have to go up Cameron Highlands for a taste now. They have closed down as well? Oh dear … pity the outlets at De Garden. Like cursed, or maybe just cannot cope with the competition, or the fact that Ipoh folks still prefer to eat delicious hawker fares than in cafes and restaurants like these.